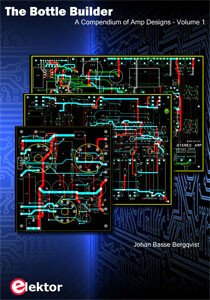 New in Elektor’s diverse portfolio of books on audio and tube technology is a massive compendium of tube amplifier designs written by Johan Basse Bergqvist. The compendium presents an impressive gallery of tube amplifier projects described not just with a personal stance, but also humor, an open mind, good anecdotes, and an equally good emphasis on all the technical aspects of design and implementation. With every project, the focus is on what makes a particular amplifier “special” in terms of design or performance, which as we all know are not necessarily in agreement. The projects range from simple (Blubottle) to ambitious (SUBSTORY ultralinear PP 50W) and delightfully also include preamplifiers, compressors, and tweaks & adds to commercial products (Neumann, Quad, Leak). The Bottle Builder part 1 (440 pages) is now on pre-order in the Elektor STORE. Order it today and be among early adopters to get a $13 discount. Expected publication: mid April 2015.